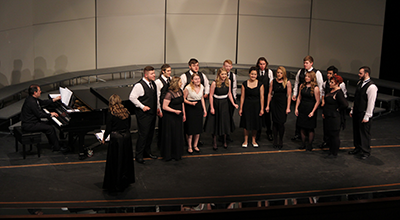 The Cowley College Concert Choir and CC Singers displayed their diverse talents Tuesday night in the Robert Brown Theatre during the groups’ final concert of the spring semester. The spring concert was titled “Sure On This Shining Night” featuring selections focusing on the beauty of the night. The nocturnal concert featured works from the lyric melodies of the Renaissance to the dissonant contemporary time periods, joyous melodies of Handel, evening sound-scapes of Saint-Saens, and everything in between. The CC Singers performed more contemporary favorites including jazz favorites, Billy Joel, and Pentatonix to name a few. The concert partnered with the Cowley County Humane Society to raise awareness for the needs of homeless and shelter animals locally and nationally. Tuesday’s concert was also the final performance for vocal music director Marcia Wieland. “I wish nothing but the best for these kids, this school, and the community of Ark City, which has taught me so much,” Wieland said. Steve Butler served as an accompanist at Tuesday’s concert. Concert Choir members: Hannah Coryea, Kristin James, Emily Lawson, Paige Lundin, Molly McCune, Megan Talbert, Ashley Daniels, Kendra Doesken, Kayla Powell, Julianna Soto, Courtney Wallace, Mairi Baker, Victoria Bardsley, Rachel Burroughs, Dameon Dill, Erin Kennedy, Riley Paye, Whitney Ossola, Ayda Yvette Rossales, Charity Schmidt, Ashley Simpson, Moriah Rae Burris, Malori Clark, Haley Golightley, Alexandria Lawrence, Monica Morris, Mary Wellman, Lizzie Wille, Caleb Bettles, Jon Claybaugh, Suzanna Smith, Kaden Boatman, Christian DiFalco, Michael Rodriguez, Semaj Smith, Clay White, Cory Blevins, Jonathan Lane, Jason Johnston, Austin Sherman, Joshua Waldorf, Austin Crowe, Zachary Heyer, Kyle Smith, and Joey White. CC Singers: Emily Lawson, Paige Lundin, Molly McCune, Mairi Baker, Riley Paye, Charity Schmidt, Lizzie Wille, Caleb Bettles, Jon Claybaugh, Michael Rodriguez, Clay White, Austin Sherman, Austin Crowe, Zachary Heyer, and Joey White.